I made these last weekend to test them out for the upcoming football weekend. We're going to my uncle for a BBQ, and I'll be baking chicken wings. In the past, I've often made deep fried chicken wings using bbq sauce which is more traditional. But I ran into a recipe with grated parmesan and minced garlic mix. I just had to try it. 1. Preheat oven to 425F. In a small bowl, mix together the oregano, rosemary, cumin and salt. Lay the chicken wings on a baking sheet and season the chicken wings with this mixture. 2. Bake the chicken wings for 20-25 minutes. While the chicken is baking, mix together the oil, fresh basil, garlic, parmesan cheese and seasoning salt. 4. When the chicken is cooked through, toss the wings with the garlic/cheese/olive oil (or butter) sauce. Serve with the blue cheese/mustard dressing. 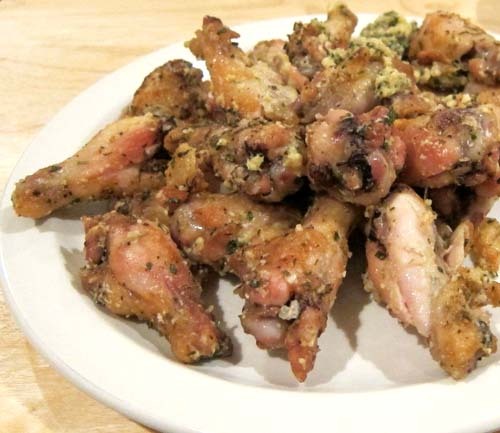 The recipe for this chicken wing delight is from http://www.steamykitchen.com/7055-baked-parmesan-garlic-chicken-wings.html.